Long ago (2013 and before) KirstenLee Cinquetti made the KirstenLee Viewer. The S19 version was about the last in the series. Until the updates stopped KirstenLee’s Viewer was the photographer’s viewer of choice. It was my daily-use viewer. I suppose the Black Dragon Viewer could be said to have taken over a similar position in the community. Firestorm Viewer is now my choice for photography. However, back in 2013 there was a bit of a controversy in June 2013: S19 Viewer Controversy. There were also some health issues in KirstenLee’s family before the controversy that I thought were the primary reason for discontinuing the viewer updates. KirstenLee is again compiling a viewer. 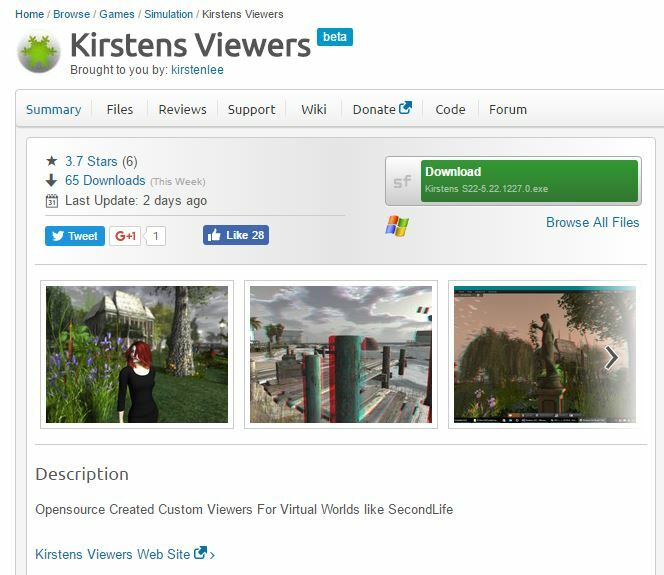 See: KV SPRING CLEAN… You’ll find the viewer in SourceForge under Kirstens Viewers. I am not endorsing the viewer nor have I used it. But, I do find it interesting that it still lives. Also, this viewer had an Anaglyph 3D feature (the middle image in the image), which would be a good reason to try it out. Anaglyph 3D: The 3D that uses Red-Blue glasses to see 3D. A problem with anaglyphic viewing is distorted color. I have my Samsung VR Gear and an S8 in process… woohoo! Just installed it. Fell in love with it all over again. Based on comparison to another viewer I’ve been using Kirstens S22 has better picture quality. I’ll have to play with this some more.